I am very pleased that you have found the way to my website! I am a master mechanic since 1980 and my passion for the Isetta is a holdover from the apprenticeship at a BMW dealership. There I got in touch with the BMW Isetta and the BMW 700 for the first time. With the purchase of the first Isetta even the idea of the reproduction of some parts has begun. There were no repair-panels available on the market, so I've finally started to produce them in-house. First, the tip ends, front wheel arches, then the first base plate, and so one thing led to another. For the past 20 years those BMW small cars exclusively rule my average working day. In my master mechanic workshop, I offer you service and more than 25 years experience on BMW Isetta, 600 and 700. For this purpose, I run a comprehensive Online-Shop with lots of original spare parts and high-quality reproductions. Many reproductions are made in-house and thus guarantees a perfect fit. In my workshop I offer Isetta engine and gear box repairs or a complete axis overhaul, accident restoration and expertise. Also broken electrical componentes will be repaird by myself. My repertoire also includes the renovation of the interior. It is taken care of everything! 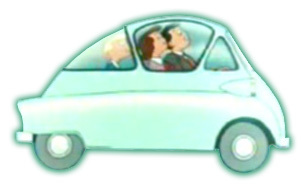 I will gladly advise you on your individual Isetta concern and support you with my years of experience and know-how!